“Stop Please Stop!” cries 23 year old John Willet as he is being “restrained” by 5 Buffalo, NY police officers. The video was all too similar to that of the Kelly Thomas murder. According to TWC News Buffalo, John Willet says he’s set to meet with internal affairs Monday morning about the beating allegedly caught on video. 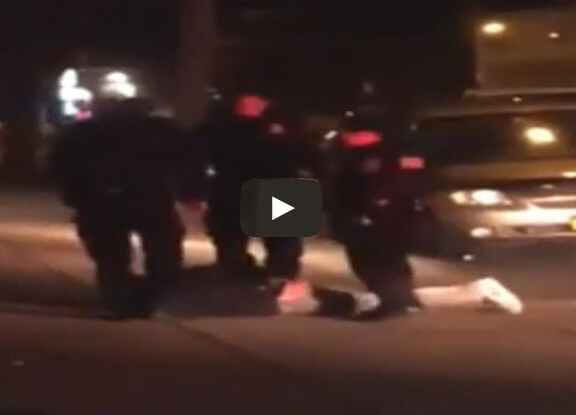 The group, Cop Block, posted this video on Youtube, saying this incident happened April 24. The video shows Willet on the ground being subdued during a stop at Philadelphia and Ontario streets. At one point, you can hear him telling the officer to stop. The video starts with one officer, but up to five join in. At one point, it appears an officer hits Willet in the head repeatedly. Local attorney John Elmore watched the video and says police can use whatever force is necessary if a suspect resists arrest. But Elmore also says excessive force was used once Willet was placed under arrest. It is unclear at this point what started this altercation. However, what is perfectly clear, is that a handcuffed man, laying face down on the sidewalk was being abused by police.